While there had been absolutely none until a few years ago, 1:18 Rollers have kept rolling from a variety of manufacturers since. 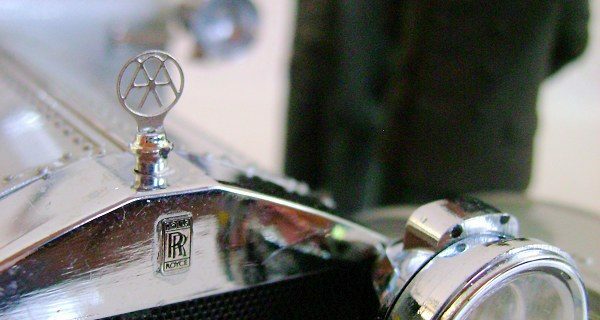 Even if you are into Rolls Royce, you will hardly buy all of what has become available within this short time. 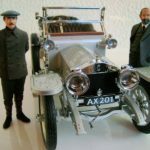 However, the 1906/7 Silver Ghost is a must-have for any serious Rolls Royce collector as the marque has always been about heritage. 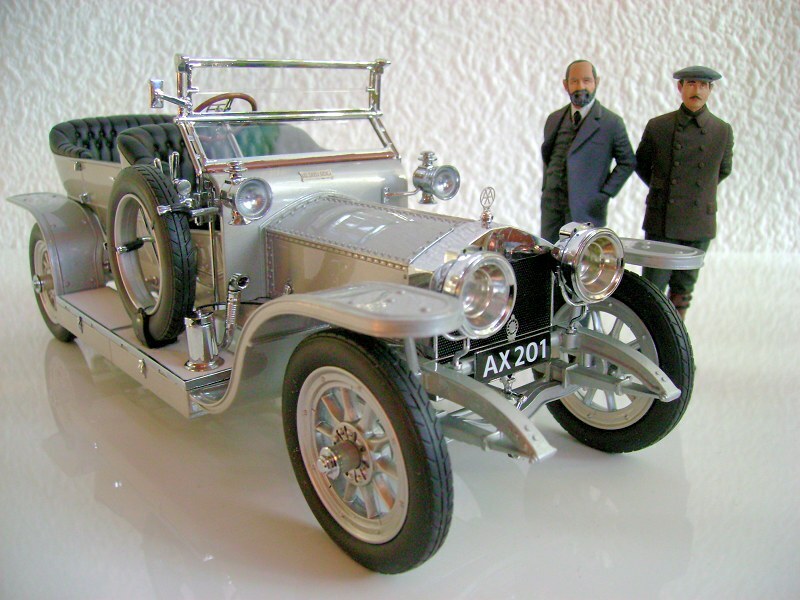 The 40/50 was the first Rolls Royce after the company had formally been established (even though Charles Rolls had sold the cars made by Henry Royce from the very beginning), this particular chassis # 60551 being the twelfth car and a demonstrator in the Semi-Roi des Belges variant deliberately painted in flashy “look at me” silver. 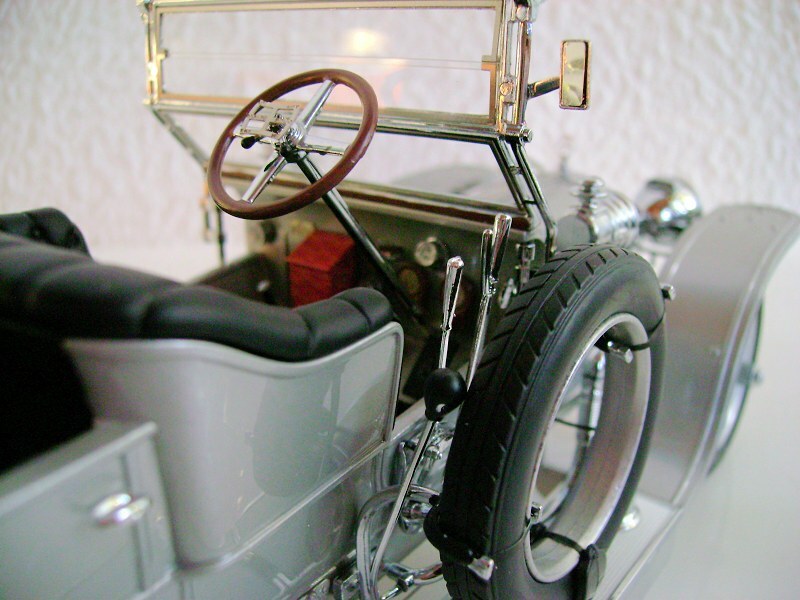 Originally, only this individual demonstrator was named “Silver Ghost” to advertise the engine´s quietness. That it was “the best car in the world” wasn’t Rolls-Royce’s immodest claim, but Autocar’s enthusiastic verdict after testing the exceptionally reliable car. 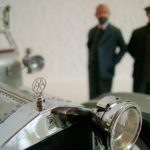 NEO’s model bears the original registration AX 201 and you can easily identify the car as a Rolls-Royce by its iconic radiator shell with a fine photo-etched mesh and the famous RR emblem. 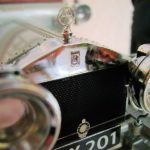 Of course, in 1907 the chrome radiator is not topped by the Spirit of Ecstasy. 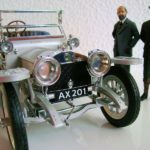 The famous sculpture was only first created by Charles Sykes as an individual car mascot, a fashionable motoring accessory then, for Baron Montagu of Beaulieu’s Rolls-Royce in 1910 and adopted as the marque´s radiator ornament for all Rolls-Royces in 1911 to prevent customers from less tasteful choices. Instead we have the UK´s Automobile Association’s logo as a radiator top. 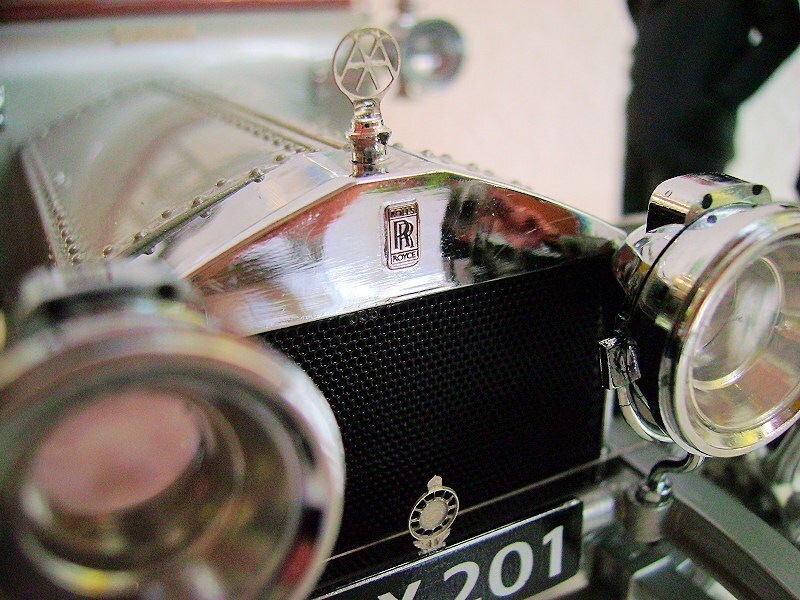 In addition, the badge of the Royal Automobile Club is mounted on the front number plate. The crank lever on the model is held by some thin brown tape (which shouldn’t be removed as it is) to represent the leather strap which kept the lever from dangling loosely. The large headlamps are only clamped into the fragile plastic frames and easily knocked off by the slightest shock and therefore usually come detached from the model upon arrival. Inside them you can only see parabolic mirroring, but no light source, while the smaller coach lights do have small light bulbs at their centre. 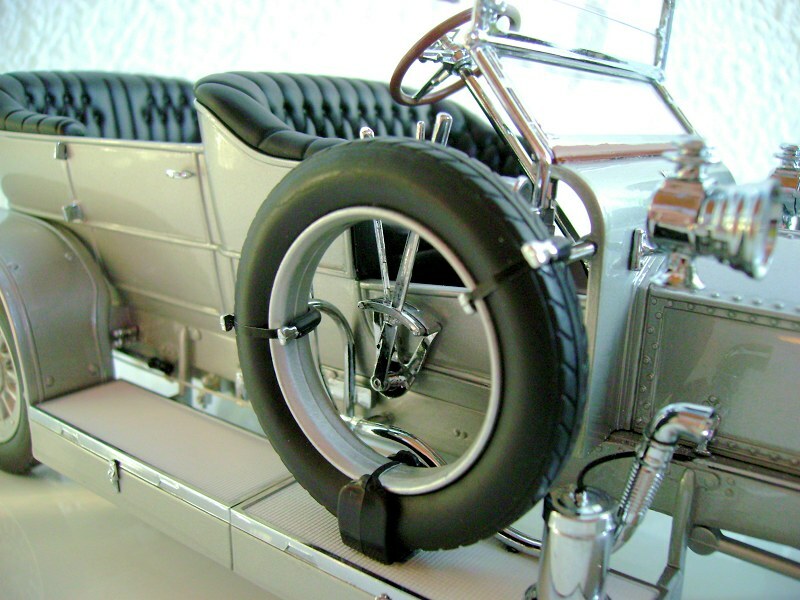 The leaf springs are of course mere plastic and the single springs are not distinguishable, neither can the front wheels be turned. 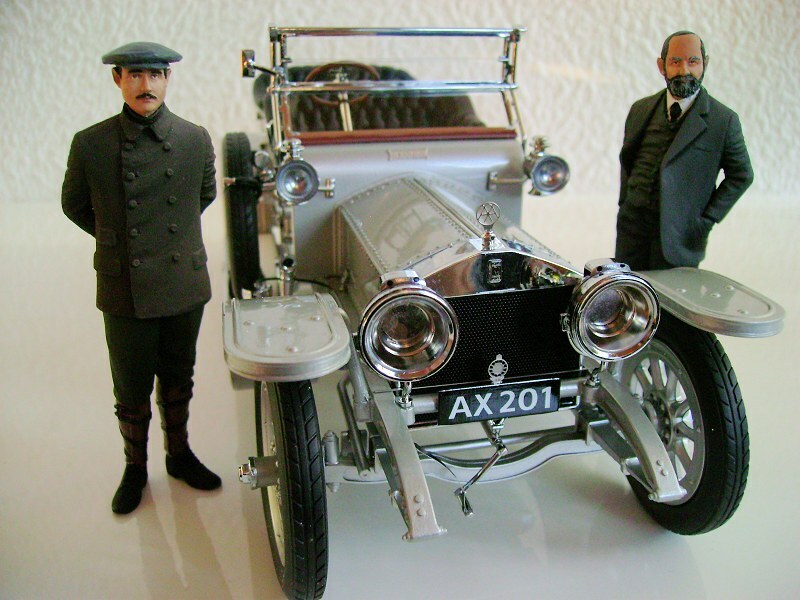 Unfortunately, this being a resin model, the bonnet cannot be opened to reveal the 48 bhp engine. Underneath the wind screen the vehicle is adorned with the Silver Ghost name plaque. That the doors don’t open on this open tourer does not really matter, though. Access for the driver is only via the doorless front passenger side, because the driver´s side access is blocked by the long brake levers and the spare tire (no complete wheel! ), while there is only a horn mounted just in front of the rear door on the left. As it is clearly out of reach for the driver, it obviously was the front passenger’s job to blow the horn. 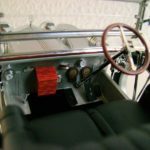 It generally seems to have been a two-men-job to operate the vehicle: There is no dashboard and gauges are mounted in the vertical part of the foot-well, one again being on the far right. 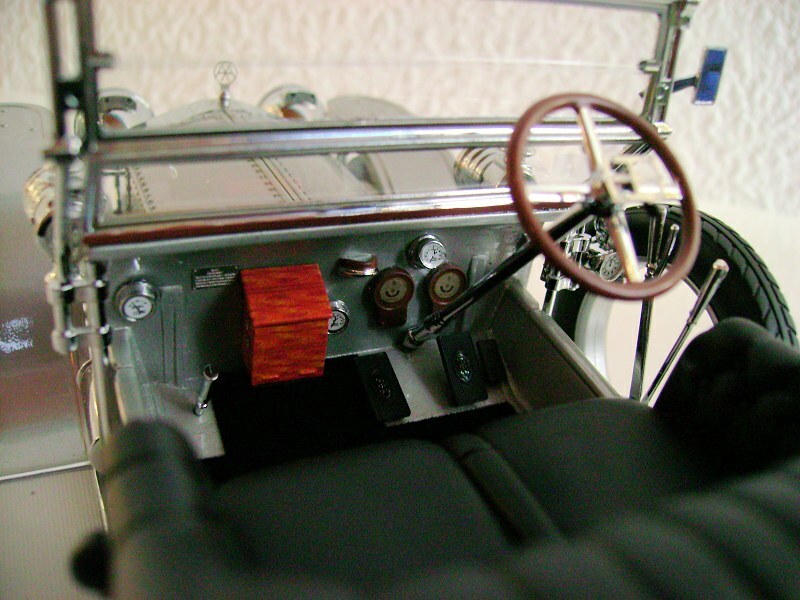 Mind how the term “glove box” is taken extremely literally and replicated in a nice wood grain. The seats, particularly the back seats, are a comfy Chesterfield sofa pattern, only that they are a dark green on the original, not black like the model´s. A bit of a shame, that unnecessary deviation from an otherwise spot on replica of a historic vehicle. 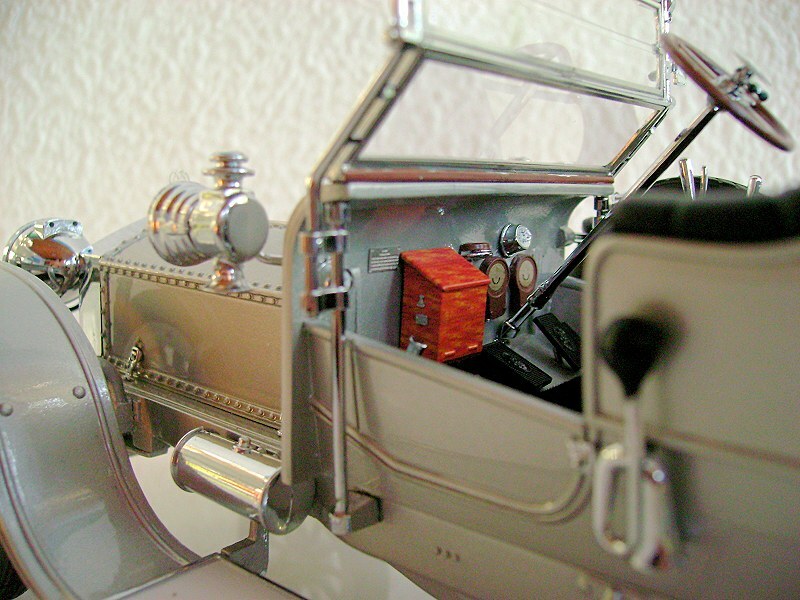 Cars ended abruptly behind the rear seats back then and so, after a brief mentioning of the exquisite single rear red lantern because the resin model’s boot is as inaccessible as it is small, would this review if I had not bought Scale Figure´s Charles Rolls and Henry Royce to go with the Silver Ghost. 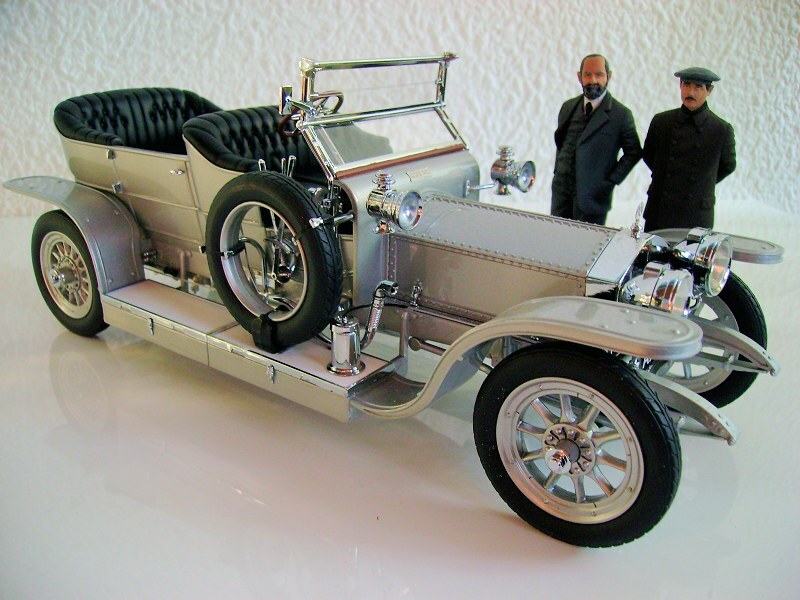 And the Silver Ghost is the only Rolls-Royce next to which Henry Rolls can historically have stood without anachronism because he sadly died in a plane crash in 1910. 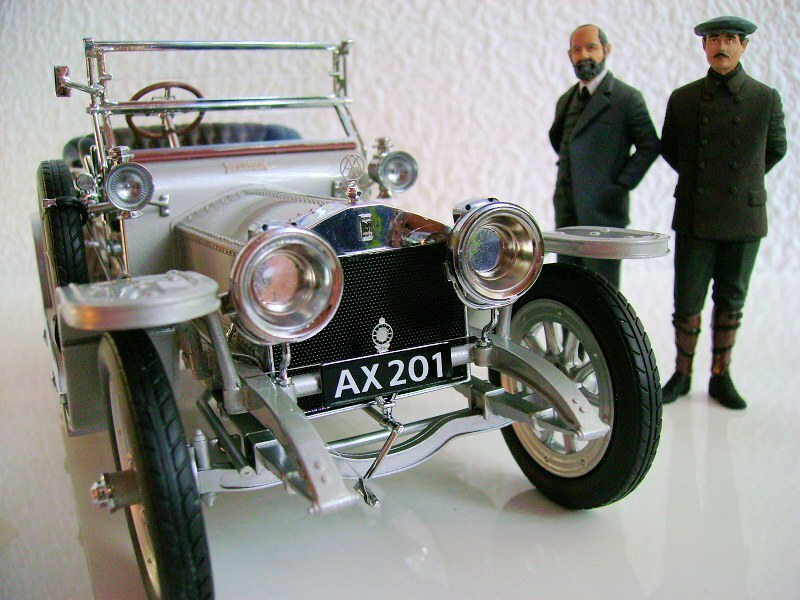 The figure is mainly modeled on the Dover statue of Henry Rolls, but without ear flaps covering his ears, more with the cap he wears on the photograph that shows him behind the wheel of the Silver Ghost. His attire depicts him well as the motoring and flight pioneer that he was. 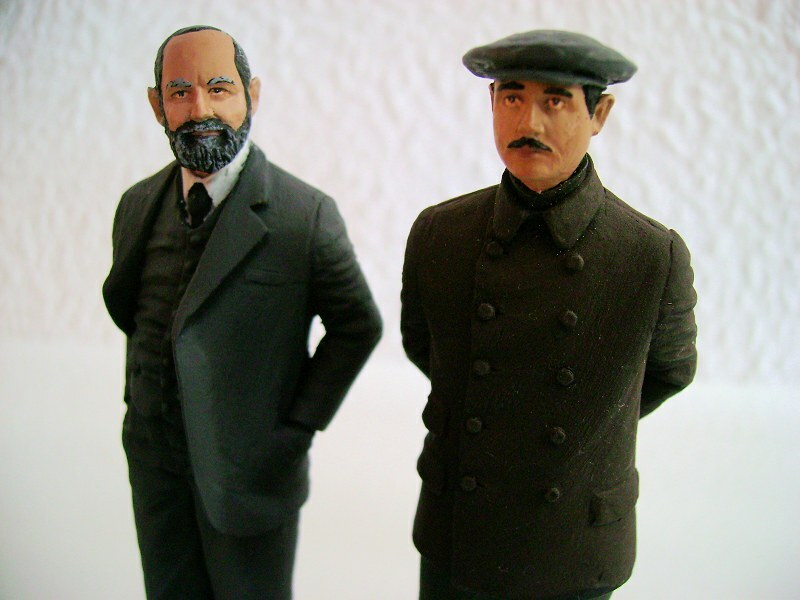 For a figurine that small his face is very well portrayed: Mind his wide-open eyes, the precise shape of his mustache and even the shape and angle of his ears and compare that to photographs of the man. It´s entirely credible that he´ll jump into the car and drive off. 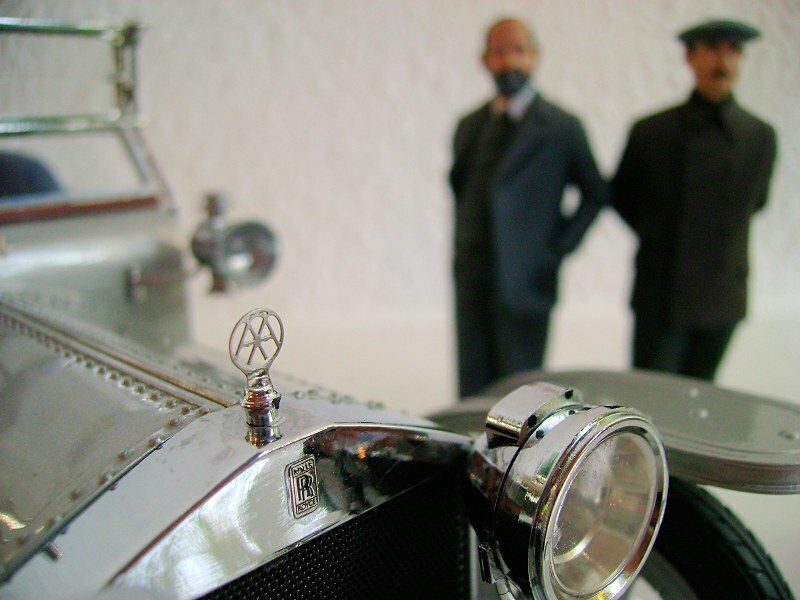 Henry Royce, the engineer behind the cars, wears a suit instead. His figurine is modeled on the Derby statue of the man himself, with the deviation, though, that he holds his head upright. His face is not portrayed badly either, perhaps a tiny bit rounder than on some of the photographs. 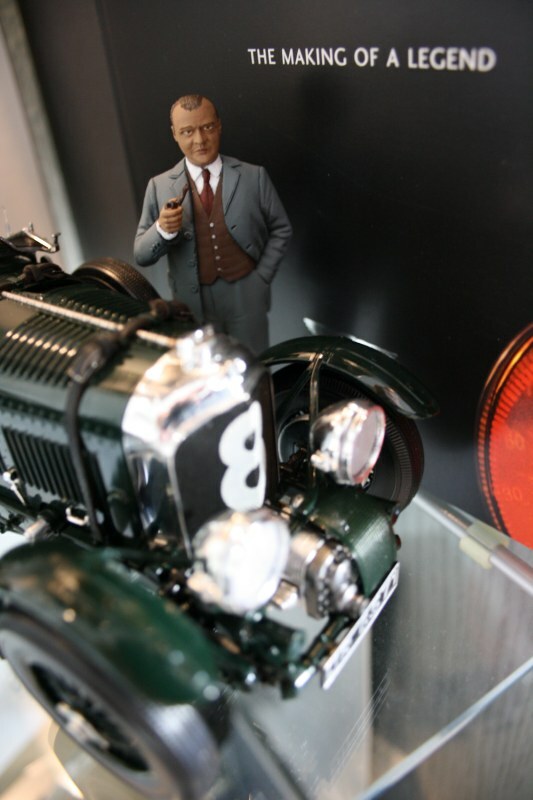 The last chap, as a bit of a joke, looks quite satisfied with his pipe from behind one of his cars, although Rolls-Royce bought his company as early as 1931 after only 12 years in existence and a lot of racing glory. 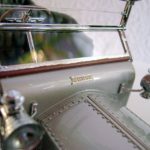 He lived for quite a bit longer than the other two, but only to see sporty variations of Rolls-Royce motorcars being badged under his name. 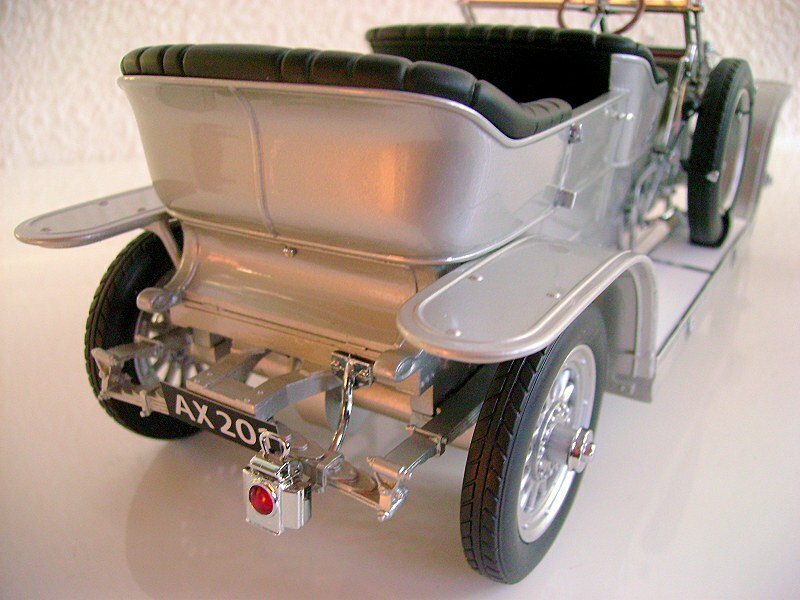 Ironically, after his death and Bentley’s independence from Rolls-Royce under VW, the AX 201 Silver Ghost is now owned by Bentley, so that Rolls-Royce have to borrow it for their promotion tours. That irony certainly causes big smiles and gives W.O. Bentley the last laugh in car heaven. 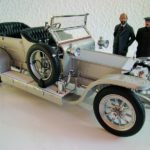 12 Responses to "REVIEW: NEO Rolls Royce Silver Ghost"
Great review. And the story behind the car and the men is very interesting. Once again, thanks for the review. Now I’m expecting the Bentley State Limousine. And I have a long list of cars that if you have time, I hope you’ll review them, just like the LR Series I. Also, since you previously asked: I meant the normal Phantom VI. Sorry for being unspecific. 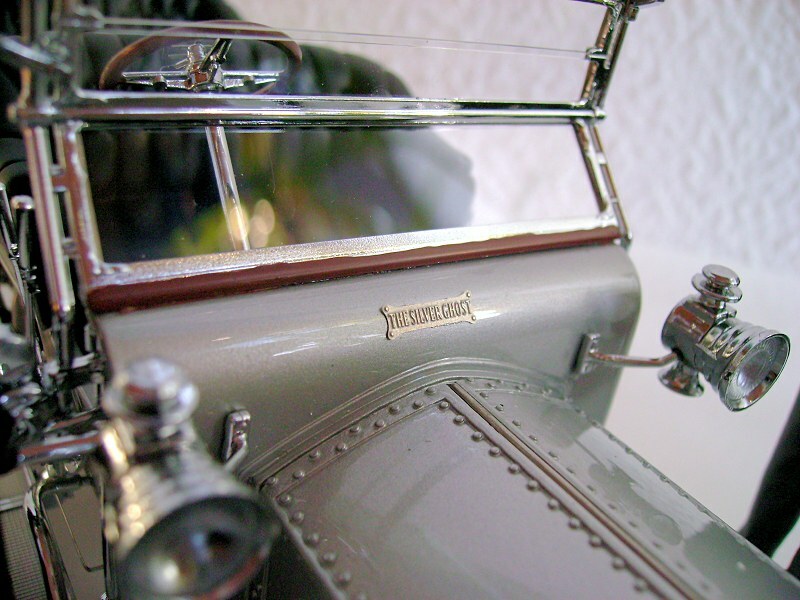 But if you can review HM Phantom VI + Bentley State Limousine too, it’d would be 2 times as cool. Woah, Hughes, that´s a long wish list you´ve got there already. I don´t plan on taking over DS´ review department. But I´ll do my best to keep submitting reviews by and by one at a time. Haha, yeah, I’m fine with waiting. It’s part of the excitement. Happy collecting! Where did you get the figures? Thanks. Those figures look great. I like the occasional use of figures, as it gives interest and scale to a model. Great and helpful review as I have been considering this model. Are you sure about the seats being the wrong color? Some of the recent pictures I have seen look as though the seats are black. Franklin Mint did their 1/24 in green: http://www.diecast.org/diecast98/html/asp/list_reviews/xq/ASP/id.JR67/qx/reviewpix.htm I guess, it´s a really a very dark green that might appear black if not lit brightly, so that it should ideally be somewhere in between Franklin Mint´s too bright green and NEO´s black. Great review and beautiful model. I consider NEO to be the best when it comes to resin models. They are to resin, what CMC and Exoto are to diecast IMO. 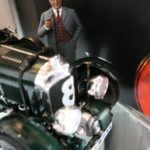 I have the Mark 8, 9 and 10 Jaguars as well as the incredibly rare silver Jaguar XJ-C. And they are all incredibly detailed models. I just wish that they’d do a 1/18 version of the Mark 5 Jaguar, not just in 1/43.